Add another candidate to the pool of people who want to be the next speaker of the Texas House, and a conundrum for candidates who aren't officially in: Late birds usually don't get the worms. The window for state representatives who would like to be the next speaker of the Texas House is open — but it could close quickly. It’s not that the race is over. Far from it. But it’s getting crowded. Candidates are going to run out of voters if the pool keeps expanding like this. Each new entrant will find a smaller field of friends from whom to solicit pledges to back them over any of the other guys. The seat is open because five-term House Speaker Joe Straus, R-San Antonio, isn’t running for reelection. It’s the first open-seat election for speaker since Gib Lewis decided to give it up — also after five terms — 26 years ago. 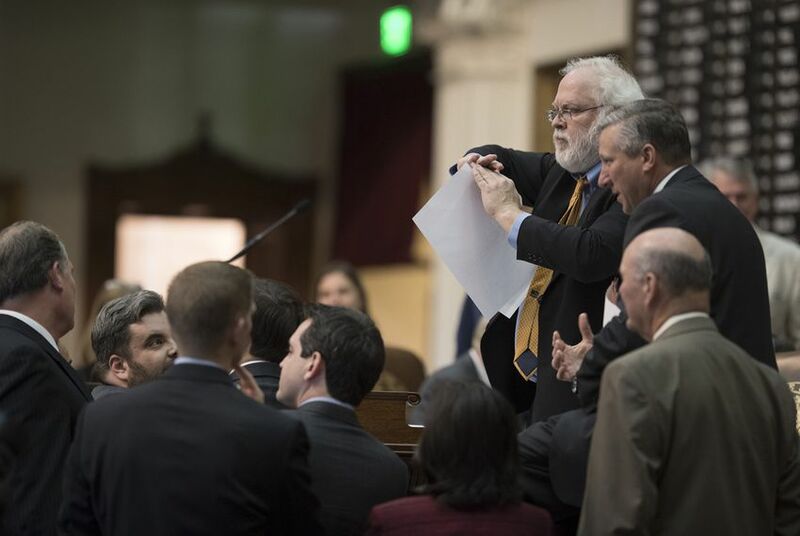 Straus’ announcement last October triggered a few speaker candidacies and a lot of speculation about what the other 149 members of the House might do, either as candidates or as the people who’ll be electing his successor. This week’s entrant is Walter T. Price IV, R-Amarillo. That’s almost a secret — he’s well-known in the Legislature as Four Price. He became the sixth Republican and the seventh candidate to file papers declaring his candidacy, increasing the size of the official field of contestants and shrinking the somewhat large unofficial field (one of whom has decided he won’t run). Your official list: Republicans Travis Clardy of Nacogdoches, Drew Darby of San Angelo, Phil King of Weatherford, Tan Parker of Flower Mound, Price, John Zerwas of Richmond, and Democrat Eric Johnson of Dallas. Eventually, what is now an additive process with seemingly more candidates every week will become a subtractive one, as weaker candidates flag and stronger ones gain momentum. Many of these people have been powerful presences in the House under Straus, building relationships and loyalties. Those are the ties they each hope will lift them alone to the 76 votes needed to be elected the next speaker in the 150-member House. Those friendships are being tested. This is not a big organization. There aren’t that many voters. Those friendships and loyalties overlap. Even if no outsiders had any interest in this — a hilarious idea, but play along for a moment — the competition would be as hard on the voters as it is on the contestants. Dozens of House members consider several of the announced candidates personal and political friends — not to mention the candidates who are poking around but have yet to file candidate papers. Price was one of those. Darby was, too, until he announced a week ago. There are more. And the outsiders are definitely playing, some gingerly, some not. Lobbyists and the interests they represent have business reasons to sweat about the power shift that’s taking place. They, like House members, are stuck between wanting the rewards that come with being early supporters of the winning candidate — and fearing the cold, cold shoulders that confront those who lined up with a losing candidate. Trade and political organizations have their favorites, for both commercial and ideological reasons. It’s a Republican House at the moment, with 95 members from that party and 55 from the Democratic Party. The actual vote for speaker won’t take place until January. Unless Democrats pick up 21 seats — unlikely, even in the dreams of their most optimistic operatives — it will still be a Republican House. House Democrats have been more united than the Republicans who hold the majority. As you might expect, the Democrats would prefer a moderate Republican speaker to one who’s from the GOP’s right wing. Many Republicans want to meet ahead of time and elect a speaker within the GOP caucus — without any say or sway from the Democrats — and then to stick together as a party when the full House votes. That Republican bloc, the thinking goes, would result in a more conservative speaker than would a majority that includes a large number of Democrats. Unlike the lobbyists and trade groups who’d like to have some influence but who will not risk their ability to get along with the eventual winner, political groups from around the spectrum are perfectly willing to throw in. Just watch Twitter. They might win some voters to their side — maybe even enough to overcome the pull of House members’ personal relationships, ambitions and legislative agendas. Their votes, ultimately, are what the candidates need most. And as more candidates enter the race, fewer and fewer of those House members remain unpledged. It’s not too late to get into the race, but it will be soon.